Writing a blog post about books is probably the most exciting thing I've done in awhile! OK that might sound really sad but is there anything better than getting as cozy as possible and getting lost in a really great book? Nope, because reading is pure happiness. Ever since I finished school a few years ago I made it a personal goal of mine to always be reading a book no matter how long it takes me to finish. About once a month I'll go to my local library and pick out 3 books I'd like to read and try to finish them that month. So far, I've been reading a ton and sticking with my goal. I find that when the weather gets colder I have a lot more spare time to read and I enjoy reading many different genres. From crime novels, to teen fiction, to personal memoirs, I love it all! 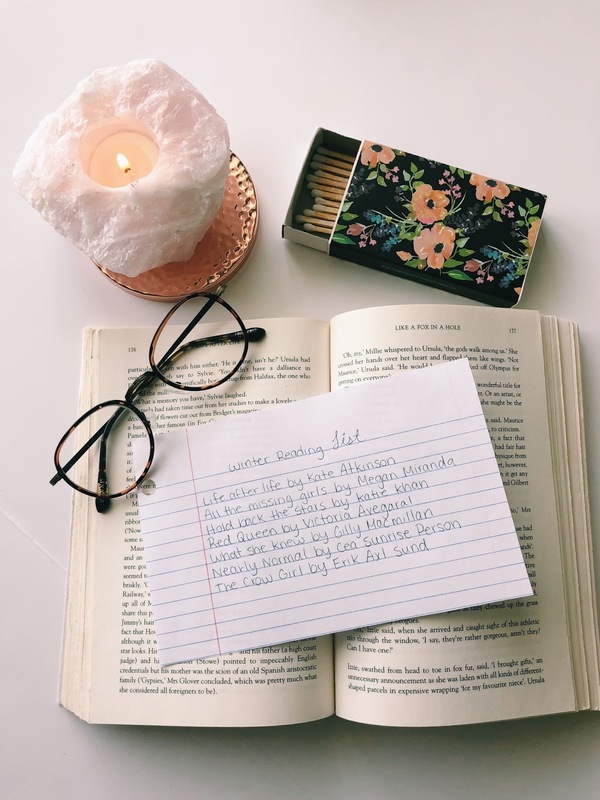 I compiled a list of winter reads that I have had my eye on, many of which are fiction novels but I put some on there that are outside of my typical favourites. I hope you enjoy! What books do you plan on reading this winter? What're some of your favourites?